During the eighteenth century, construction of country mansions such as that in the present lot became popular amongst city merchants. For Amsterdam merchants the favourite areas were Kennemerland and the river Vecht. The mansions brought their owners in direct contact with nature as was then the fashion; hence the broad sash windows, that can be seen depicted here and that indicate a date of construction in the middle of the eighteenth century. In A.J. 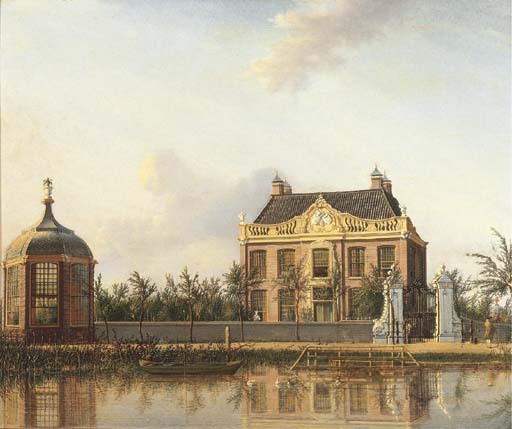 van der Aa, Aardrijkskundig Woordenboek der Nederlanden (1848, p. 899), Vredevelt mansion is recorded as situated on the Beemster, Northwest of Pumerend, at Volgerweg 59/60 (see L. Brandt Buys, De Landelijke Bouwkunst in Hollands Noorderkwartier, 1974, p. 18, fig. 9). At present there is a farmhouse at this location, built in circa 1792. It is therefore likely that the mansion depicted in the present picture existed for a short time only and had been demolished by the end of the eighteenth century. The artist is unrecorded. His linear, painterly style suggests that he was probably active as a draughtsman of topographical sites. This is confirmed by two drawings recorded in the RKD: one of Muiderslot, which was sold at auction in Utrecht, 19 February 1936, lot 482; the other of A View of Sterkenburg, Utrecht, in the Atlas Munnik van Cleef.